Heat oven to 450ºF. Place pie crust in 9-inch tart pan with removable bottom or 9-inch glass pie plate. Generously prick crust with fork. Bake about 7 minutes or until very lightly brown. Cool on cooling rack 5 minutes. Reduce oven temperature to 325ºF. Meanwhile, in small bowl, beat cream cheese and icing sugar with electric mixer on low speed until smooth. Add orange peel and eggs; beat until smooth and well blended. Spread in partially baked crust. 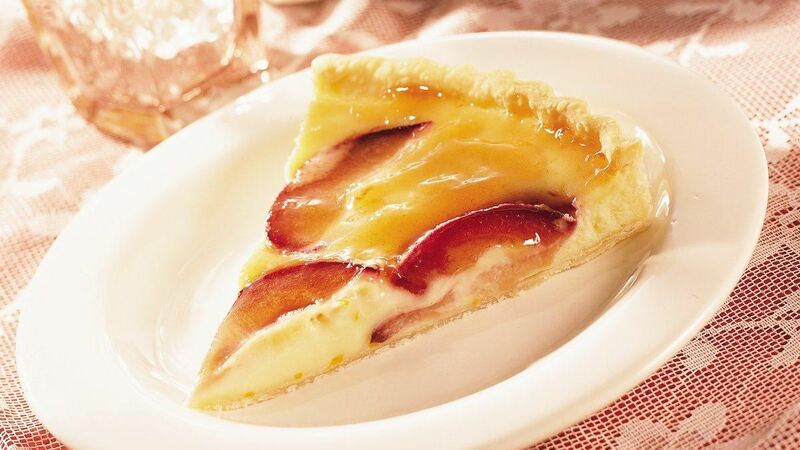 Arrange sliced plums over cream cheese filling. Bake at 325ºF 25 to 30 minutes or until filling is set. Cool on cooling rack 15 minutes. Refrigerate at least 1 hour until chilled. Just before serving, brush melted jelly over tart. Cover and refrigerate any remaining tart. Tip: For the sweetest flavor, choose ripe plums. To speed up the ripening process, seal the plums in a brown paper bag for a day or two. The size of plums varies; if they are small, buy one or two additional plums.